Global Lithium Ion Battery Market size in 2016 was valued over USD 24 billion and is predicted to witness gain of over 12% from 2017 to 2024. Stringent government norms toward the disposal of lead coupled with growing demand for electronic devices will augment the lithium ion battery market. Rising demand for smartphones, activity trackers, laptops and smart watches form developing countries will positively stimulate the product penetration over the forecast timeline. Longer discharge cycles along with improved shelf life are some of the key underlying parameters which will further provide impetus to the business growth. Growing adoption of hybrid and electric vehicles along with promising government policies toward sustainable technologies will drive the market growth. In past five years, China, U.S., UK and Germany have witness a significant upsurge in electric vehicles (EV) demand on account of emissions norm and cost competitiveness. In 2016, over 250,000 electric vehicles were sold in China representing 75% increase from 2015. Ease of availability, high energy density, and long cycle life are some the paramount factors which will foster global market share. These products can deliver higher current when compared to available counterparts which makes them preferable for power intensive applications. Cathode, in 2016 accounted for over 30% of the global market share. Growing adoption of lithium iron phosphate and nickel manganese cobalt oxide across consumer electronics and automotive sector will boost the product demand. Ability to improve the functionality and operational life are some of the key features which will encourage the adoption of separators by the manufacturers. Electrolyte is projected to witness strong growth owing to increasing manufacturing facilities along with ongoing research and development towards improvement in product design. Electrolytes facilitate the movement of ions from cathode to anode during the charging process and reverse this flow while battery is discharging. Regulations to curb carbon emissions along with rising electric vehicles demand will drive the automotive lithium ion battery market growth. The U.S. government has introduced federal income tax credit to promote adoption of hybrid and electric vehicles. As per the federal purchase initiative, hybrid and electric vehicles are eligible for USD 7,500 tax credit. Introduction of fuel economy standards and tax credit on EV charging equipment will further enhance the business landscape. Consumer electronics in 2016, accounted for over 35% of global market share. Emphasis on utilization of portable medical devices along with growing demand for mobile phones across developing economies will positively influence the business landscape. Declining cost of smart devices, growing adoption of IoTs and rising disposable income are some of the prominent factors which will boost the product demand. Lithium iron phosphate in 2016, accounted for over 9% of overall market. Longer cycle life, high current rating, excellent thermal stability, enhanced temperature tolerance, and safety are some of the key attributes which make adoption of these products favorable over available alternatives. Nickel manganese cobalt is projected to witness gains over 11% on account of its applications across power tools, electric powertrains, and e-bikes. Combination of nickel and manganese enhances the specific energy, which helps in achieving low internal resistance. These systems can also be customized to work as power and energy cells. Growing adoption of smart devices coupled with shift toward digitization across industrial and healthcare sector will augment the U.S. market. Rising electric vehicles demand due to favorable government policies will further complement the business growth. In 2015, the U.S. accounted for 11% increase in sales of electric vehicle from 2014 levels. 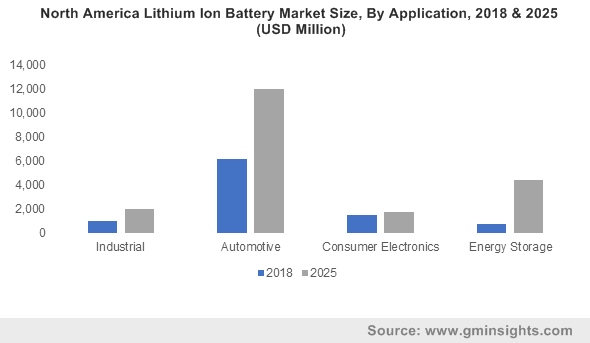 Increasing demand for consumer electronics along with positive outlook towards automotive sector will drive the China Lithium ion battery market. Government initiatives to reduce pollution from battery waste will further stimulate the business growth. In 2016, the Government of China introduced regulations to reduce poisoning from lead disposal industry. Germany, in 2016, accounted for over 20% of Europe market. Rising demand for electric vehicles along with rising consumer awareness to adopt eco-friendly technologies will positively impact the industry growth. Government initiatives including subsidies for residential lithium ion battery systems will further boost the product demand. Key industry players including Panasonic, Tesla, Samsung, GS Yuasa, Hitachi Chemical, A123 Systems, Philips, LG Chem, Sanyo, Toshiba, EnerDel, Valence, ProLogium, Saft, Roofer, Energus Power, Duracell and Johnson Controls. The industry participants as a part of strategy are focusing toward merger and acquisitions to strengthen their market position. In January 2016, Johnson Controls and Tyco entered into an agreement to function in the field of energy storage with prime focus on research and development of the lithium based batteries. Lithium ion are a rechargeable battery and offers better storage capacity, longer lifecycle, and improved efficiency when compared to available alternatives. These products are available in various chemistries including lithium iron phosphate, lithium titanate, nickel manganese cobalt oxide, lithium cobalt oxide, nickel cobalt aluminum oxide and lithium manganese oxide.